Today, among the most popular health products are prebiotics and probiotics. Below we shall look at the best probiotic supplements (just scroll down if you are in a hurry). But first let us look at what these are and how they help boost your health. You have over 400 different types of probiotics in your gut that are busy inhibiting pathogen growth and promoting healthy digestion.However, things such as antibiotics, toxins and poor diet can kill off the good bacteria while inviting bad bacteria to settle in. For this reason, it is essential that you arm yourself with the best probiotic supplements. Something that is often overlooked but equally important is prebiotics. These are what feeds and supports and stimulates the growth of healthy bacteria (probiotics) in the gut, and thus promoting better health and well-being. Probiotics are live cultures and prebiotics help sustain them. Like all living things, probiotics whether in your gut or in a container need nourishment and sustenance, which prebiotics provide. The term synbiotic refers to a product that is both a prebiotic and probiotic. BioTrust Pro-X10™ is one such as supplement, but also more. Why? Probiotics are live cultures: This means that not only do they have a finite lifespan; they also need nourishment to live. They are extremely sensitive to changes in environmental conditions. From manufacture, to multiple stages of transportation and storage, many of them will have died. A big number of the remaining probiotics, after time and the environment have done their part, get killed by stomach acids. This means that, in the end, you may end up getting less than 10% of the biological value. Which also means that you get less than 10% of what you paid for. Not a good deal. But there is a solution. Microencapsulation Technology™: Encases each probiotic cell in a lipid matrix that protects it from light, oxygen, bile and stomach acids. This enhances the survival of the probiotic cells on the shelf and through the stomach. Actazin™: From the kiwi fruit, known for its prebiotic properties. This helps nourish the probiotics thus enhancing their survival rate. It also offers fiber to support gastrointestinal health and regularity. Polyphenolics: These too help support probiotics as well as digestive health, while inhibiting the growth of intestinal pathogens. Pro-X10™ contains three different types of probiotics, including one known to support oral health and fresh breath. It is not hard to see why this product is our top choice when it comes to prebiotics and probiotics. 1 year unconditional money back guarantee. This product NOT sold in stores. Formerly called Digesten-K, the goal of Xtend-Life Kiwi-Klenz is to clean out toxins, balance flora and restore optimal functioning capabilities to your digestive tract. It is formulated with all of the essential components of kiwifruit, including skin, enzymes and phenolics. Cleaning Out the Toxins: Adequate daily fiber intake is essential to good health, especially if you consume large amounts of protein. Fiber staves off pathogens and diseases by inhibiting the growth of the unwanted forms of bacteria. Balancing Bacteria: Natural prebiotics stimulate the growth and reproduction of probiotics, which are the good bacteria that your intestinal tract needs not only for digestion but also for fighting infections and supporting your immune system. 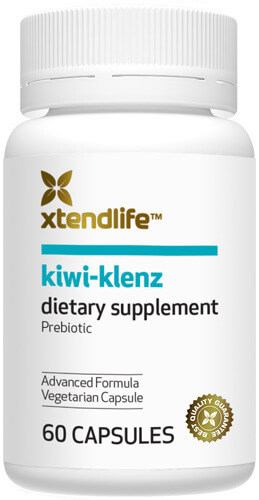 Restoring Digestive Function: The digestive enzymes found in Xtend Life Kiwi-Klenz help break down proteins into a form that is most bioavailable for your body. Your body is then better able to assimilate nutrients that you consume via supplementation and diet. Made using the advanced triple extraction Aqua-Pure system, no toxic chemicals or harsh solvents are used when extracting the fruit and fiber of the kiwifruit. Heat is not used, thus preserving the vital nutrients and enzymes. This makes it one of the best probiotic supplements on the market. Additionally, Xtend-Life Kiwi-Klenz is produced using the skins of the kiwifruits for added fiber. Prolonged storage and heat destroy the unique enzymes of kiwifruits. Therefore, taking Xtend-Life Kiwi-Klenz is one way to guarantee that you are getting what you need from your kiwi fruit. 6 months unconditional guarantee. This product not sold in stores.